I assume the purse is empty, if you know what I mean. Should be a great accessory, if you are, or were, a twin. Head aside, the rest of the ensemble screams “just a little something thrown together by a homeless schizophrenic”. ‘Specially the footwear. What’s really wrong with this “outfit”, IS the shoes. “She” should be barefoot, or donning some Vans flip flops. Black toenail polish, of course. Why is “she” so mad?? Didn’t know that the girl from ‘The Ring’ bleached her hair. Plaid AND a floral pattern in the same outfit. High fashion, at the local homeless shelter…..Ya takes whatcha kin git, Baby! 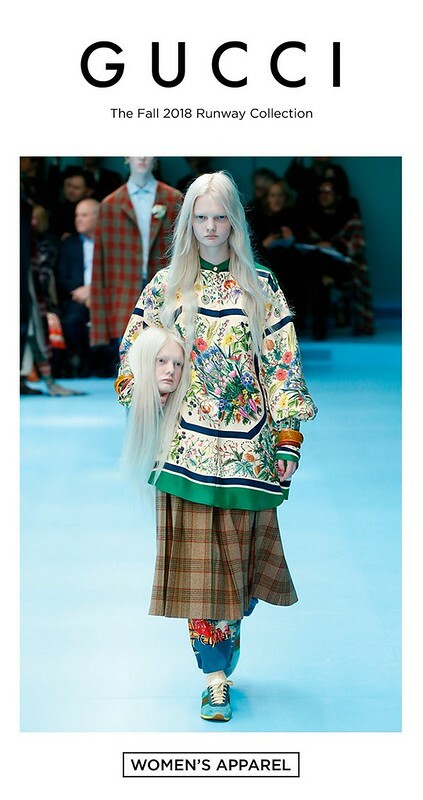 This is why I hate “high fashion.” Inspired by Queen Boudicca, I guess, but it’s just plain stupid. The fake head has a friendlier expression, but then again wearing that ensemble would make anyone hostile.